i hope you had a nice weekend, those of you who had a long one i hope it was great! My birthday was pretty low-key, which was okay after last week. The boys were pretty excited about my birthday though. Artoo kept saying all day "you're 35 today!!! you are the same age as dad!! it's your birrrrrrrthdaaaayyyy!!!" We didn't get up to much, as Artoo was still recovering from being in the hospital. But he was doing so well by the end of the week that he made a special guest star appearance on our local news morning show. We were on the news that morning talking about the Beads of Courage Colour Fun Run that we do every year to raise money for Beads of Courage Canada. The weather took a turn, just in time for the long weekend - as it does in Saskatchewan, and the temps dipped below freezing a few nights, so we took advantage of the one nice day to take the boys for some ice cream. B-rad and Chewie did some work on the driveway this weekend - as we prep for rebuilding the fence this summer. Monday we did a bunch of work around the house, b-rad did more work outside and i got to some of those nagging tasks that have been bugging me. Then my mom came over around supper time and my hubby took me out for a belated birthday dinner, and a walk by the river. Every time i'm down by the river i'm reminded of what a beautiful city i live in. It was nice to get some things done - it was kind of a bummer that the weather was so lousy. But apparently the temps should be nice and warm this week. Weekly Challenge #218: "White on Black on Found"
This week's challenge is an option. The challenge is to do a white on black tile or zentangle inspired piece of art - using a white pen on black paper. HOWEVER, i know that not everyone has access to those art tools. So, there's also the option of creating a tangled piece on a found object instead or in addition to white on black. personally, i love the look of the white on black tiles, but i never seem to have the patience for them because there's a lot more 'finessing' of the gel pens, i find. It seems that the ink will flow better if you almost 'dab' the gel onto the page, and then move very slowly. Which, in hindsight, may be a good thing when it comes to creating a tile. I find the white on black to be quite challenging. I used a Sakura Gelly Roll white gel pen. They work fairly well, but i also like to use the uniball Signo white gell pen, they ink seems to roll out quite nicely. I also find that the black zentangle tiles are not as thick as the white ones. i think i prefer the weight of the white tiles, myself. 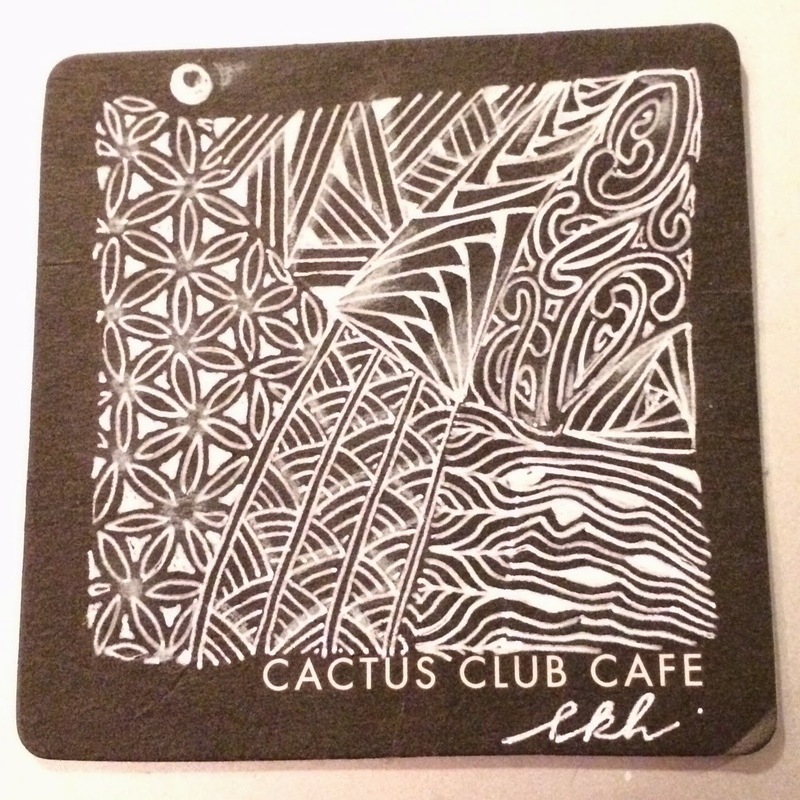 However, as you can maybe tell - this is a found object... it's a black coaster from the Cactus Club where B-rad and I went for supper on Monday night for my birthday. It turned out pretty great, and maybe part of the reason i like it is because of the sturdy weight of the coaster. 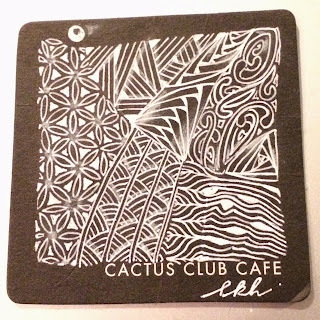 I have a habit of taking coasters and tangling on them. They just beg to be tangled, sometimes, don't you think? Jean's right. 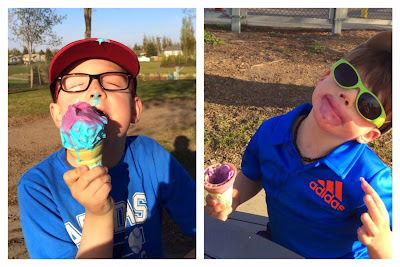 Those ice cream cone photos are great. You can tell they are really enjoying them. this seemed a nice day to take part in this challenge. 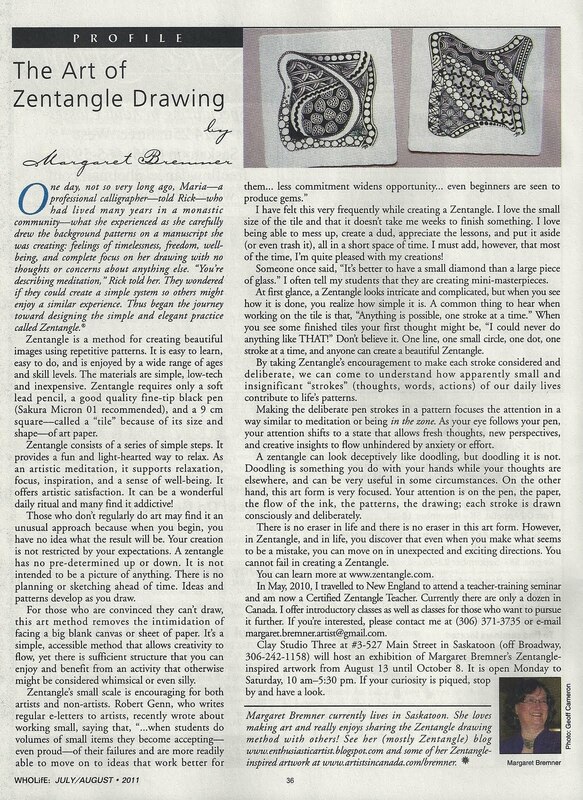 Thanks for keeping my interest is zentangle going. Good to see your little guy on the mend. And a good birthday with all of your guys at home. Take care and thanks for another great challenge. Sarah. Sometimes those quieter birthdays are the most enjoyable ones!!! So glad that lil' Artoo is feeling better! Wow, you guys are becoming famous!!! Who can resist that lil' guy!! I hope that your TV debut will help raise money for Beads of Courage!!! I loved this challenge! So many times, I want to use a black tile , but always go to 'Good Ole' Trusty'. It is so different working on black!! But it was fun!! Thank you for keeping us on our toes!! I agree with Annette. Sometimes the quiet times are the best. Glad you got some time with your hubby too! It was fun trying tangles I had never used before on this challenge of white on black! Who knows might even try a ZIA on a found object if I have time later on. Looks as if you had a beautiful birthday...you can tell the guys in your life really love you! I want to try this challenge. I am new to zentangle and maybe in this way I will stick to my plan to learn and develop. Looks like a wonderful birthday, spending quiet moments with your family. This was a fun challenge and for me, working on a black tile is challenging. Thanks for the opportunity! Glad your had a nice Birthday. Hope things have calmed down for you. Hope you can continue to have a little down time. I am glad you finally got some hubby time alone and the children are on the mend. I enjoyed the black & white challenge this week. Hi - hopefully my Tumblr post URL worked - thanks for the challenge! White on black is new to me, so I enjoy the chance to practise. I thoroughly enjoyed the challenge this week, it was one of the most relaxing I've done in quite some time, I just put tangles together one at a time until it was all filled in. Of course, your tile was quite inspirational... such a lovely piece! Thank you, Laura! A belated Happy Birthday. It looks like it was a good one. And I'm glad to hear that Artoo is on the mend. Thanks for the challenge; it was a great one, as I love white on black. So looking forward to seeing the tiles - white on black is really challenging for me and I'm sure I'll learn a lot and be inspired to try a few of my own. My black tile box sits lonely in a corner….